Porsche Cars North America will install the same chargers in its 189 U.S. dealerships. 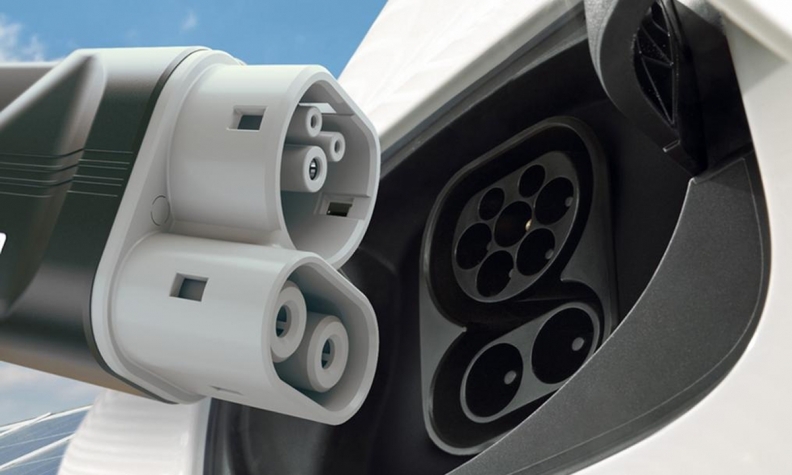 Porsche Cars Canada will equip its 20 Canadian dealerships with 800-volt DC fast-charging stations in preparation for the launch of an electric sedan based on the Mission E concept, the company has confirmed. The car is expected in 2019, with Canadian and U.S. sales beginning late that year or in early 2020. Porsche Cars North America will install the same chargers in its 189 U.S. dealerships. Porsche Cars North America CEO Klaus Zellmer said it's not too early to start preparing the retail network. "Charging infrastructure is an extremely important part of the EV experience as a whole," Zellmer said in a statement. In addition to the dealership chargers, Porsche just installed six fast-charging stations at its U.S. headquarters and the Porsche Experience Center in Atlanta. Stations also will be installed at the automaker's Experience Center in Los Angeles. "We are also working with other organizations on a network of DC fast-chargers for cities and highways," Zellmer said. Residential charging — at least in the United States — also will be an important piece of the puzzle, he added. Zellmer didn't give a timetable for the installation of the chargers in the dealership network or elsewhere. Porsche has boasted about the quick-charging capability it will deliver in the Mission E production vehicle, which will have an 800-volt architecture. The fast-charging stations will be able to charge the vehicles to 80 per cent of their capacity — around 250 miles — in less than 20 minutes. The car's total range is expected to top 485 kilometres (300 miles). Stefan Weckbach, Porsche's head of battery electric vehicles, said the production car will be unmistakably a Porsche in its handling, sportiness and design. It will be able to quickly accelerate to top speeds repeatedly without emptying the battery, he said in a statement. "The Mission E will offer reproducible performance and a top speed which can be maintained for long periods," Weckbach said. Weckbach also talked about changes being made for the production version. Cameras in place of sideview mirrors, as shown on the concept, are a no-go in the real world. "The legislation currently in force would make it impossible to offer such a thing around the world in a series-production vehicle," he said. "We've also had to make other changes to the concept vehicle -- some structural, some functional -- to prepare it for series production. But the car and the Mission E are surprisingly similar." Designers tried to take advantage of the opportunities presented by the battery placement in the vehicle floor. For instance, rear-seat passengers will get more room for their feet in a recessed section of the battery block. Weckbach acknowledged that Porsche's signature sport exhaust sounds will be missing from the car. Don't expect the brand to pipe artificial engine sounds into the passenger cabin. "Porsche is unlikely to lower itself to gimmicks of this kind or use sound effects to mimic a bubbling eight-cylinder," Weckbach said. "But we will give due consideration to sound as an emotional factor in the Mission E, using the design approach typical of Porsche and incorporating a clear reference to the technology."